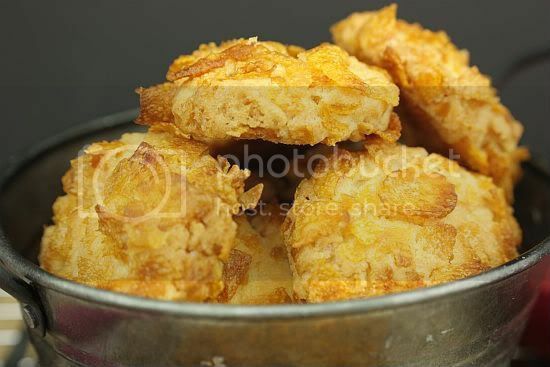 I always remember cornflake cookies as one of the many variety of cookies that would be served in our house during Chinese New Year. In fact you would probably find this cookie being served in most Chinese homes during this festival period. I'm not sure why I had a graving for cornflakes cookies a few months back. As I really could not remember the recipe my mum had used, I randomly took one off the internet. I tried it out but somehow the cookies did not turn as I had hoped. So I dropped an email to my sister who is currently residing in Melbourne to ask for her recipe. Ever since I tried out her recipe, I've made these cookies on four separate occassions. 1) Beat soften butter and sugar until light in colour. 2) Add egg and vanilla extract. 3 Fold in flour in one go and shape the biscuit dough into the size of small limes. 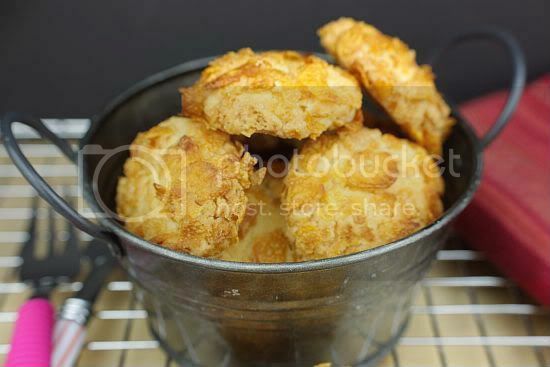 4) Roll the dough balls into the cornflakes and place on a lined baking tray about 1 1/2" apart. To make self-raising flour, mix 150gm plain flour with 1 tsp baking powder. For variation to the cookie recipe, you can add in 1/2 cup of raisins or cranberries. 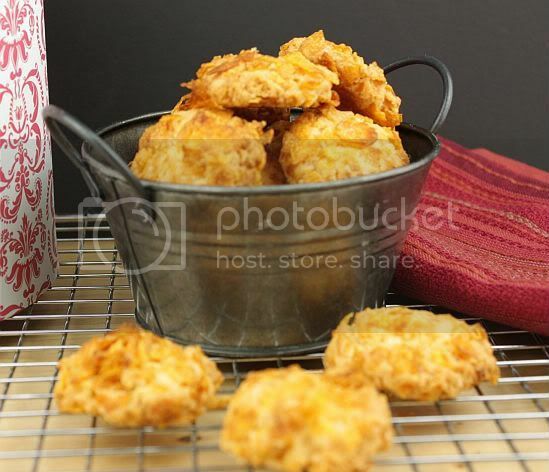 Love the cornflake cookies...so crunchy and addictive! If I gotta eat cereal I'd much prefer to do it this way. Ooh...this is my favorite. I always like to bake cornflake cookies with black currant for CNY. These cornflakes cookies look like the real thing!! Georgous & very appetizing looking! Jo, cornflake cookies also bring so much of my childhood memories. Love the buttery crunch there. Yea, I also add raisins to mine. Dunno why leh ... Love the tart sweetness that raisins imply. cornflake cookies are just so festive. they're addictive too...i like the crunch of the cornflakes. and the buttery taste is sinfully good! I have never made cornflake cookies! (we don't eat cornflakes around here). But i do love the crunch! The kitchen and your whole house must be smelling good! just the recipe I was looking for. thanks!! hurray! Eating is really one of my hobby i mean part of my life and cooking is my passion. I also love going to a place and at the same time taste their delicious and most wanted food.I want to taste something that is new to my palate. Thanks for sharing your article with us. I love baking and experimenting with new recipes. I hope you enjoy your stay here and do leave me your comments! And if you do try out any of the recipes, I would love to receive your feedback. Kindly note that all photographs from this blog should not be published without prior permission from the author.